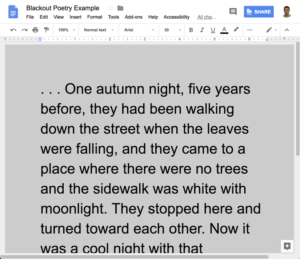 Blackout poetry has become increasingly popular in classrooms everywhere. If you’re not familiar with blackout poetry (a.k.a. 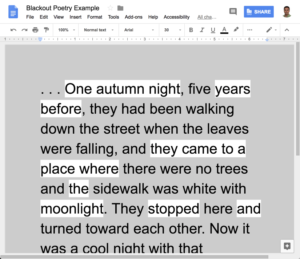 erasure poetry), it’s a form of poetry where students take an existing text and black-out, or somehow obscure, most of the text, intentionally leaving behind words to create their poem. 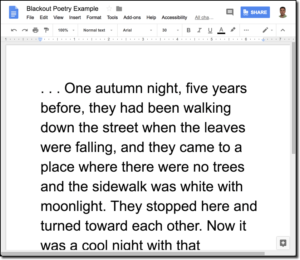 I’ll walk you through the specific steps for making digital blackout poetry with Google Docs, Word, and Pages. You can also download free, detailed tutorials for each option. Aside from the fact that ripping pages out of books tends to be frowned on, creating blackout poetry digitally has some real advantages. Three advantages that stand out to me are the ease of editing and re-editing. It’s essentially impossible to bring back a word that has been marked out with a sharpie compared to selecting “undo” digitally. 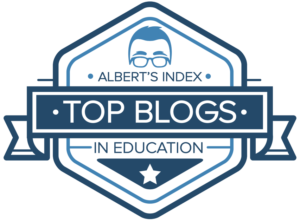 The second advantage is that it’s easy for teachers/readers to see the original work with just a few clicks. Third, digital blackout poems can be shared with a broader audience online. 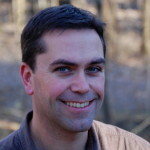 Create a new document and paste an existing text. Get the text arranged on the page (ideally one page) so that it looks the way you want. 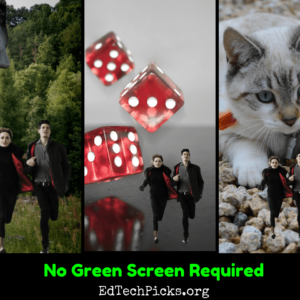 Change the page background to gray (or any color other than white or black). Select the first word(s) that you wish to INCLUDE in your blackout poem. Select the highlighter tool and change the color to white. Continue highlighting (in white) all of the text you wish to include in your poem. 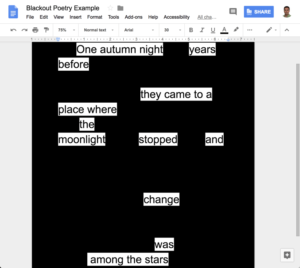 Creating blackout poetry follows the same steps for most digital platforms. In the coming weeks, I’ll add tutorials for Word, Pages, and iPad. A printable, detailed tutorial is available at the bottom of this post. 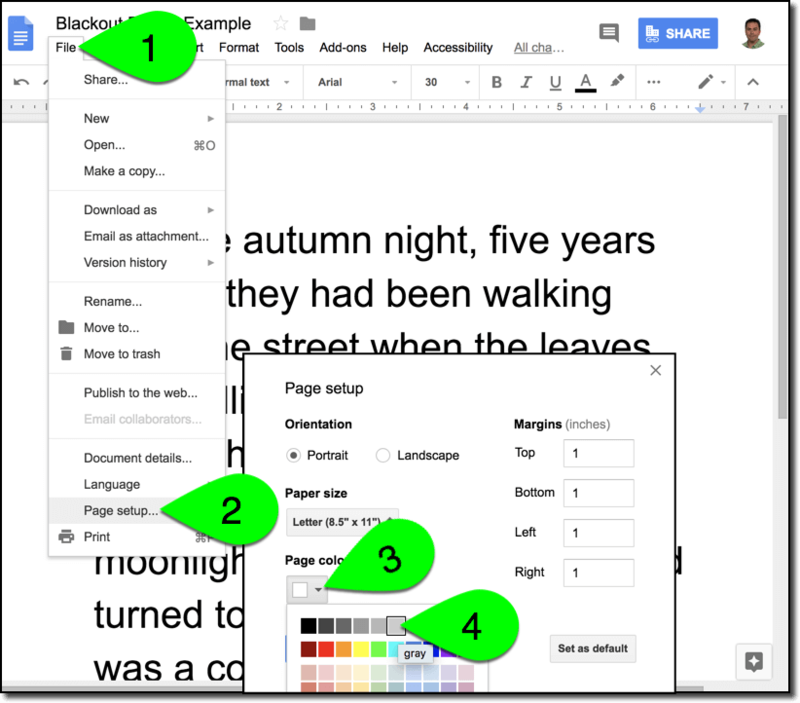 Changing the page color is fairly easy in Google Docs. Just click File and select Page Setup, then select your new page color. Highlight the text you want to keep in white using the highlight tool. Repeat the steps you followed before to change the page color, but this time choose black instead of gray. Change the page color by selecting the Design menu, then clicking on the page color tool. Change the page color to black using the steps you followed before. Get started by tapping on the More icon and selecting Document Setup. Add a shape by tapping on the + and selecting the rectangle. Resize the rectangle to cover the entire page. Tap on the paintbrush and change the rectangle color to gray. Select the text you wish to include in your blackout poem and choose Highlight. Use the steps for changing page color and change the page color to black. 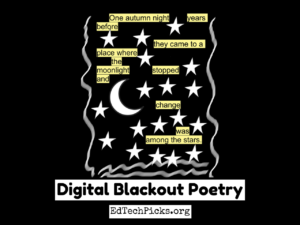 Do you have any tips or suggestions for making digital blackout poetry? 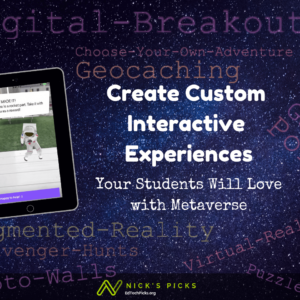 Want to share some of the awesome things your students create? 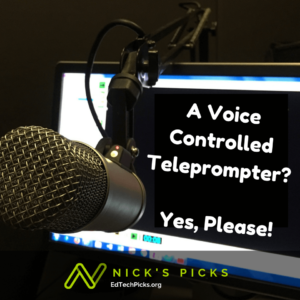 Share away in the comment below or on Twitter.